Sunday, March 27 dawned rainy & a bit grey, but the forecast promised sunny skies later in the day. Once we headed out the door it wasn't raining & the wind was picking up, blowing the clouds away. 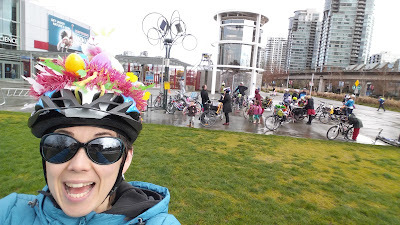 When we arrived (a bit late, heh) at Science World, the decorating had already begun with many "bonnets" sporting bunny ears, bikes with balloons, easter grass, pipe cleaner springs & stickers. Once all the families had arrived & had a chance to socialize a bit, we gathered for a group photo (aka official head count) then headed west on the seawall. Thanks for taking this shot, Anthony! #YVRFamilyBikiing Second Annual Easter Bonnet Ride, March 27, 2016: 42 people! The wind was chillier than some had expected so a few families left in search of hot drinks & warmer clothing along the first leg of our ride. By our first stop at the Jellybeans in Charleson Park, the headwind was making riding a bit challenging for some of us, especially the little riders. 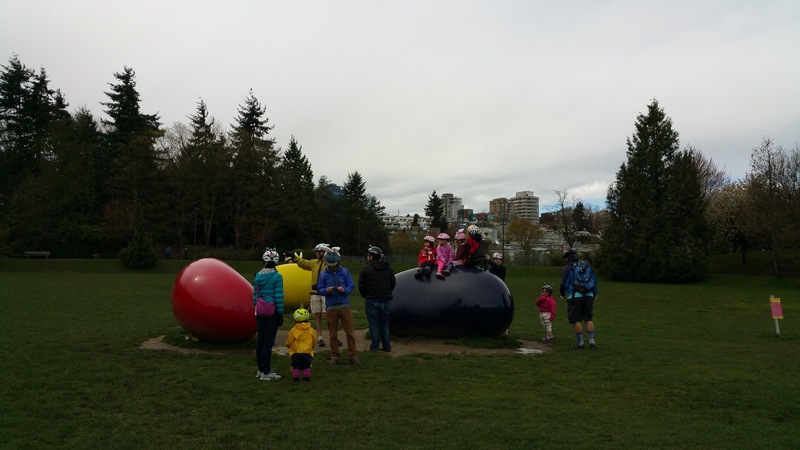 The kids loved the quick break & a few even decided to relocate the red Jellybean! Once we rolled the giant bean back into place & took lots of photos of various children on & in front of the jellybeans, we got back on our way west. There were lots of smiles & "Happy Easter!" greetings as we rode along with our balloon bedecked bikes, bunny ears, & waving children. We had quite a few new Vancouver Family Biking members along & they had lots of opportunities to chat as we rolled along the seawall. Stop two in Hadden Park was planned because of the public washrooms. Once everyone had a chance to use them if needed, we continued on for the less windy part of the route, a bit farther away from the waterfront. 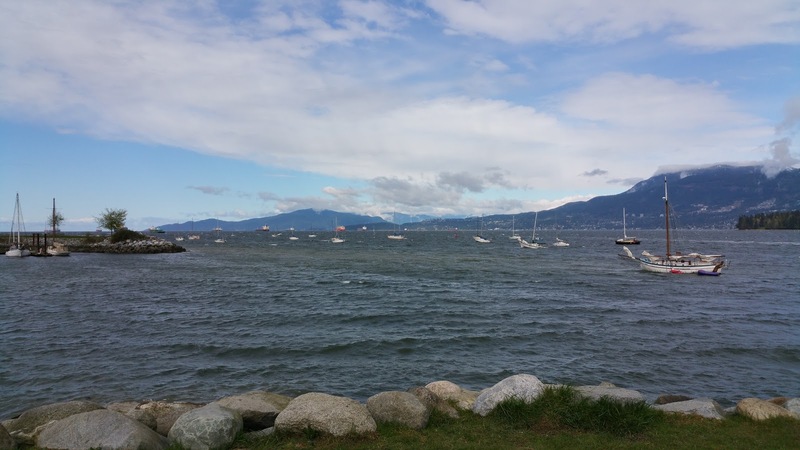 We rode through Kits Park, then along the Point Grey bike route. It's always a fabulous place to ride with children since it's so traffic calmed, much of it featuring fully separated facilities for pedestrians, cyclists, & drivers. Parents could relax a bit more since the kids riding their own little bikes didn't have to worry about being hit by parked car doors flinging open or being passed too closely by drivers. When we arrived at our Jericho Beach park, we headed straight for the feral bunny colony in the blackberry bramble patch near the tennis courts. 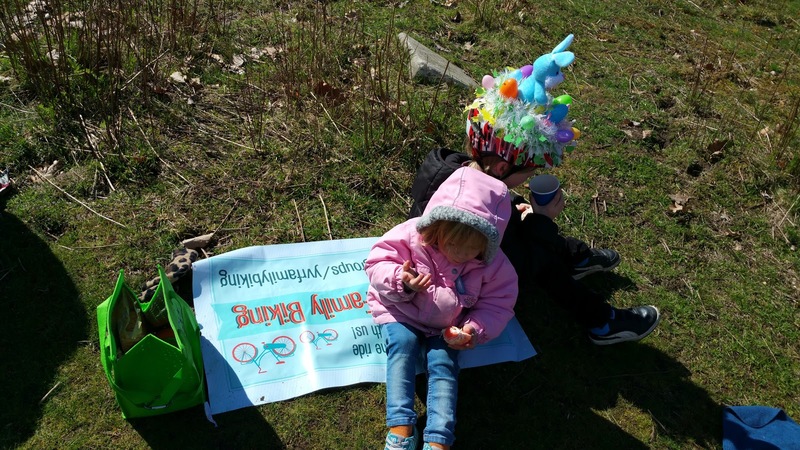 The kids quickly hopped off the cargo bikes, out of the trailers, & off their own bikes to run around looking for bunnies. We found a slightly sheltered patch of grass nearby & had a picnic, including chocolate eggs, bagels & hot chocolate shared by various members of the group. I got a chance to talk to a few more new families & overhead lots of conversations about riding, bikes, & gear. Besides the usual complement of front & rear seats, child trailers & trailabikes, we had three Surly Big Dummy longtail bikes, two Yuba Mundo longtails, & a Yuba El Boda Boda midtail. We also bumped into friends riding their three box bikes: a Metrofiets, a CETMA, & a hand built frame. 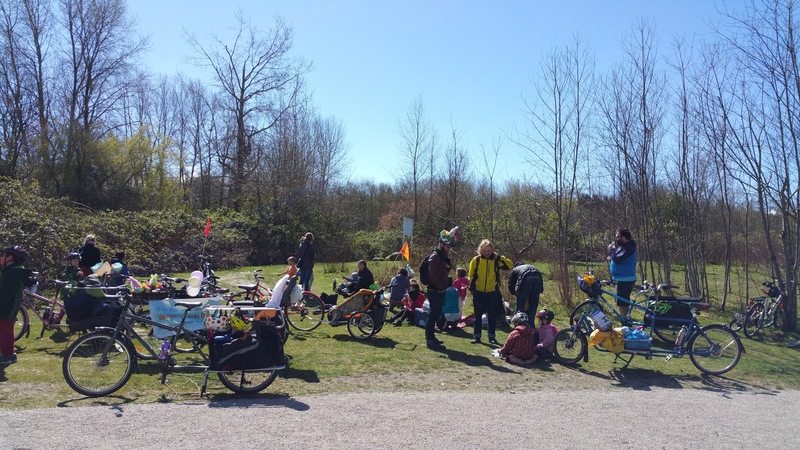 Cargo bike party at Jericho! After everyone had eaten, families headed out in smaller groups when they were ready to go. The breeze had died down a bit, but it was now a tailwind, helping us home. It was so sunny & bright I think I may have gotten a bit sun burnt! 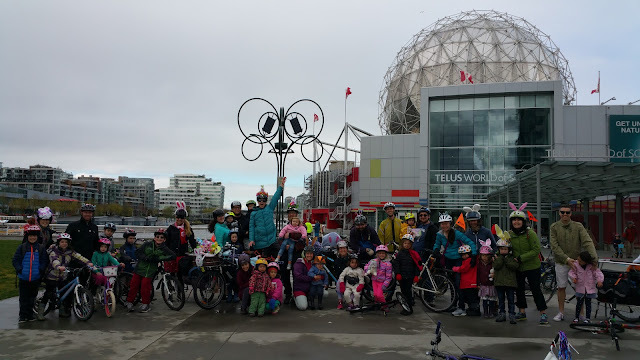 Overall, it was a great turnout--42 people at Science World--& a fun ride. Having planned stops along the way worked well so the kids could run around a bit & the riders could get a chance to take a quick break. We'll definitely do that again. I'd like to start planning two rides a month--one like this one (9km each way) or longer, & one shorter than this, maybe 5km maximum. Do you have any feedback from the ride that could help make the next one better? I welcome your suggestions below! Let me know if you have any ideas of destinations or routes for future rides, too! Thanks!